All Diamond, Gemstone, & Gold weights are approximate and can vary slightly. Price reduced! This is a beautiful ring that I paid to have polished and inspected by Le Vian. Looks brand new! Purchase price was $1000. This aquamarine ring has 18 round brilliant diamonds and is set in 14K white gold. It is stamped with Le Vian and 14K on the inside. Certificate of authenticity and registration is included, as well as Kay jewelers receipt. Also, ring box is included. This would make a perfect gift for that special someone! By 5.8 mm. Sapphire has natural inclusions. Ring weighs 4.8 grams. Ring size is in between 6.75 and 7. Ring can be resized. Ring is hallmarked: Le Vian 18k and has been tested for purity. Ring is in perfect like new condition, have been cleaned and polished by a professional jeweler. PRE-OWNED Levian 14 K White Gold Pink Sapphire Diamond Ring. PINK SAPPHIRE IS OVAL 7 MM BY 5 MM BEING NEARLY 3/4 CTTW WITH TINY ACCENT DIAMOND ON EACH SIDE. Condition is Pre-owned. SHOWS LIGHT WEAR AND COULD USE A GOOD CLEANING AND POLISH. Very beautiful Levian diamond & fine quality ruby ring in 18 karat white gold. Necklace / Pendants. Ruby weight..75 carat. Gold Charms. Silver Jewelry. Ring size. 7 free professional ring sizing included. Levian 14K Blood Ruby Diamond Ring Band. Beautiful ruby has nice blood color VS clarity. Ruby is 6.9mm X 5.2mm weighs (1.00ct). Ring size is 5.25 (this ring is resizable). 12 round diamonds, total weight 0.20ct. The main stone is 7mm wide and 9mm long. It has 10 small accent diamonds. Designer / Maker: LEVIAN. Hallmarks / Trademarks: "585" AND "LEVIAN". 100% NATURAL SAPPHIRE AND DIAMONDS. GEMSTONE 2: ONE (1) OVAL NATURAL UNTREATED BLUE SAPPHIRE. BEAUTIFUL DEEP BLUEBERRY COLOR, VERY CLEAN WITH NO VISIBLE INCLUSIONS TO THE NAKED EYE, EXCELLENT COLOR SATURATION AND TRANSPARENCY WITH AN APPROX. Material: 14k gold. WE CAN POLISH FOR AN EXTRA COST. Pre-owned Levian. Bottom Band Width: 4.6mm. Top of Band Width.45in. Maker LeVian. Markings LeVian, 14K. Blue Sapphire. Gemstone Details. Gender Ladies. Accent Stone Type Diamond. Main Stone Cut Square Faceted. Ring Band (Shank) Width 4.65mm tapering to 4.16mm. Primary Stone: Natural Tsavorite Garnet AAA. Era: Modern. Accent Stones: Natural Diamond. Total Diamond Weight: 0.87 Ct. Ring Face: 16.5 MM. Designer / Maker: LEVIAN. Hallmarks / Trademarks: "14K" AND "LEVIAN". GEMSTONE 2: ONE (1) OVAL NATURAL UNTREATED TANZANITE. BLUEBERRY BLUE COLOR, VERY CLEAN WITH NO VISIBLE INCLUSIONS TO THE NAKED EYE, EXCELLENT COLOR SATURATION AND TRANSPARENCY WITH AN APPROX. 8.1 x 6.0mm faceted blue topaz (1.50ct). - 32 round chocolate diamonds (.75ctw, I1 clarity). - 14k White Gold. -. 90ctw total diamond weight. - 28 round white diamonds (.15ct, G color, I1 clarity). - Size 6.75. Hallmark: 14kt Le Vian. This ring is made with genuine 18k white gold and features a total of 1.50 carats of Aquamarine and Diamonds! The Aquamarine is radiant cut and approx. 50 carats. The Diamonds are Chocolate and White and are approx 1 carat. Levian 14K. Diamond Earring. Gemstone Earring. Pearl Earrings. Diamond Rings. Blue Topaz & Diamonds. Opal Pendants & Necklaces. Opal Rings. Here is a gorgeous 14k White Gold Natural Purple Tanzanite ring. The main stone on this ring is a Oval Purple Tanzanite. Along with the main stone, this ring also has a White Half moon Sapphire. 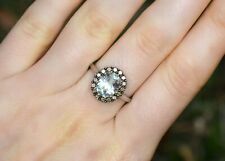 The ring size is 9.75 and weighs 7.7 grams. Gorgeous 14k White Gold Ring. Width of Band = 3 mm. Total Mass = 7.1 grams. Size = 6.75. 73 round pink sapphires (3.65ctw). - 76 round diamonds (.60ctw). - 8.3mm high. - 13mm wide. Up for sale is a beautiful Le Vian ring crafted in 18K white gold. Fluted shoulders are polished to high shine. Stamped 18K 750, hallmarked with the maker's mark. Necklace / Pendants. Gold Charms. Silver Jewelry. Ring size. 7.5 free professional ring sizing included. Our exceptional reputation matters most to both us and you …. Diamond quality. VS-G.
Pictures are magnified 50x to show details that may not be visible to the naked eye. The natural round cut pave set 1.25mm Diamond accents (10 total) are I color, VS-SI clarity, and weigh a combined total of . 10 carats. Authentic Le Vian 18K natural pink sapphire and diamond ring in excellent condition. The sturdy classic setting features an 8mm x 6mm 1.50 carat fine quality natural pink sapphire and. 60 carats of VS2 F diamonds for a total carat weight of 2.10 carats. 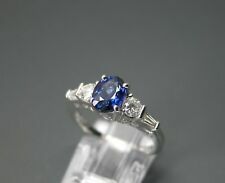 Sapphire tested and is natural, 7.5 X 5.7 X 3.3mm and approx 1.5ct. Marked: 18K and makers mark. Total 134 diamonds tested and are natural, approx 1.5ct TW, most about VS and G-H range. Large Selection of Diamond and Fine Jewelry. Pictures are magnified 50x to show details that may not be visible to the naked eye. The intense vanilla. 80mm round brilliant cut natural diamond accents (40 total) have outstanding VS-SI clarity with no visible inclusions, and they weigh a total. 45 of carats. Love, Love, Love This Ring! It Is So Fabulous And Gorgeous! This Dragonfly Ring Is Just Stunning! By World Famous New York Designer, Famous World Wide, Le Vian. Superb Quality! Designed In 14Kt White Gold With Gorgeous Hot Pink And Yellow Genuine, Sapphires And Diamonds. Gold: 14kt White. Stone Weight.71ct Tanzanite. Length: 3/8". This ring is set with one genuine Oval Sapphire in the center and six natural Round diamonds. These diamonds are H color, SI/I clarity and weigh a total of. 06 carat. Featured is a very unique and desirable tanzanite gemstone ring crafted by renowned jewelry design house Le Vian. The solid 18kt white gold ring features a bezel set teardrop cut natural tanzanite at its center weighing about. 90 carats. The intense honey orange-yellow Citrine has VS2-SI1 clarity and shows no visible inclusions. Pictures have been magnified 50x to show details that may not be visible to the naked eye. Accenting the main Citrine are pave, halo, and peek-a-boo set, 1.25mm white Sapphire accents (88 total) that have outstanding VS2-SI1 clarity with no visible inclusions, and weigh a combined total of. 88 carats. This authentic LeVian ring is finely crafted in solid 18K White Gold and set with genuine Lemon Quartz in the center, green Tsavorites, and white diamonds. This is a very clean gem of a great intensity and strong brilliance. This Ring Features a 5 x 7 mm, 1.23 Carat Oval Cut Precious Tanzanite. It is Accented by 2 Approx 4.5 x 4.5 x 4.5 mm Trillion Cut Diamonds. The Diamonds are G-H in Color and SI1-SI2 in Clarity. The Gemstones are Set into a 14kt White Gold Single Cast Mounting that weighs approx 2.19 dwt. Levian large diamond & citrine ring in 14k white gold new with tag. Necklace / Pendants. Gold Charms. Silver Jewelry. Ring size. 6.25 free professional ring sizing included. Our exceptional reputation matters most to both us and you …. Diamond quality. VS-G. Designer Le Vian. - Center oval tsavorite (.25ct). - 2 side oval tsavorite (.30ctw). -. 55ctw total weight of tsavorite. -. 43ctw total diamond weight.